I’m not sure that’s a good thing but I was encouraged to do this. I’m going to tweet things that I think are interesting but don’t rate a full post on the blog. The link to the feed is at the bottom of the left sidebar of this page and here. Today’s tweet is a retweet of a link to the crazy things monks wrote in the margins of the books they were copying. This has happened before with the notorious Pharma Hack that hit WordPress sites last year. It was a nightmare cleaning it all up and hardening the site. After that happened, I started an account with HostGator and moved some of my sites there. I left this site on Dreamhost with some sites that I run for other folks. I wanted to compare the two hosting services. Hostgator is far more secure but pages hosted there load VERY SLOWLY and you lose traffic. Also, they have this ridiculous practice of not backing up your files. Sites at Dreamhost load fast. In fact, they load up to five times as fast as HostGator BUT Dreamhost seems to be a cesspool of hacking. Nothing is secure there. I’m in the middle of a bit of a crisis in the real world with my brother in the hospital and his wife who has dementia going off the deep end, so fixing this site will have to wait until I have my brother home and safe with a care-giver. The hack is not malware and it will not hurt you. Links to not so nice sites that are not G rated have been placed on some pages. If you see strange things happening here, it is happening because I’m cleaning up the mess. I apologize. UPDATE: I’ve removed the nasty links from the offending pages but I have not had time to reset the security so they may come back. UDATE No. 2: FYI for anyone else experiencing this hack, the links were hidden in a file named cashe.php. That is not a typo. The code to call it was in the header.php. Delete cashe.php and upload a clean copy of a header.php and the offensive links will be removed. UPDATE No. 3: The vector for the hack appears to be in the main .htaccess file. I’m restoring that now. Hopefully, this will be the final chapter in another hacking story. Last UPDATE: Google has finally crawled the pages that were displaying the foul links and all is clear. I try to keep everything that I do online strictly G rated and it was painful to see such revolting items in the keywords used to find this site. At least 80% of the people using the offensive search terms, were from Iran. What does that say about oppressive regimes? 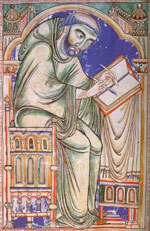 Your host and scribe is a student of medieval history, book arts and illuminated manuscripts. Contact email is scribe at medievalscript dot com. Map the Universe A blog about collecting antique maps.